Do you are suffer with low back pain, neck pain, carpal tunnel? Have you been told you need back surgery? Decompression Therapy is an effective treatment for these conditions. It is very affordable and less expensive than surgery. 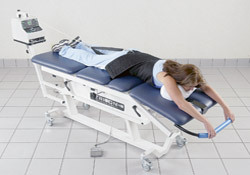 Our system allows your to receive Lumbar Non-Surgical Spinal Decompression while laying on your stomach if the is the most comfortable for you the patient. Do you have a herniated disc, multiple herniated discs, degenerative disc disease, facet syndrome, or any other type of spinal problem? Is your doctor suggesting surgery, Pain Management, or Physical Therapy? Have you tried Chiropractic and just could not get enough relief? Come see us and try out Spinal Decompression Therapy. 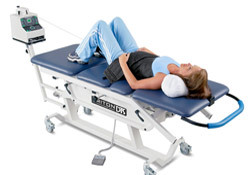 Our system allows your to receive Lumbar Non-Surgical Spinal Decompression while laying on your back if the is the most comfortable for you the patient. A patient’s comfort is our top priority, and we want their visits to be enjoyable and successful. Treatments are short in duration, most completed in under an hour, and administered while you’re fully clothed. Most patients undergoing this treatment report improvements and a reduction in their pain after only a few sessions. Spinal Decompression Therapy gently stretches the spine, relieving pressure from the discs, joints and muscular tissues, while enhancing the body’s natural healing process. The gentle distractive forces creates decompression, the unloading due to distraction and proper positioning, to improve blood flow and important nutrient exchange to the injured area. 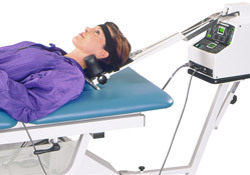 Your comfort and safety are of primary importance during Spinal Decompression Therapy. Therefore, unlike any other decompression device, you have several positioning options. Only if you’re 100% comfortable will you be able to achieve the ultimate objective of complete rehabilitation of your discs and spine. During decompression, you’ll experience several cycles of stretch and relaxation, which gently graduates to a peak over a period of several minutes. Our system allows your to receive Non-Surgical Spinal Decompression for the cervical spine for those who have disc problems in the neck. Therapy sessions typically last less than 20 minutes and most patients feel pain relief with as few as 6-10 treatments. It is important to remember however, that pain subsiding does not infer that your discs and spine are healed, so it’s critical that patients stick with the treatment protocol prescribed by their practitioners in order to achieve the full value of decompression. You owe it to yourself to contact our office today to make an appointment to see if you’re a candidate for Spinal Decompression Therapy.